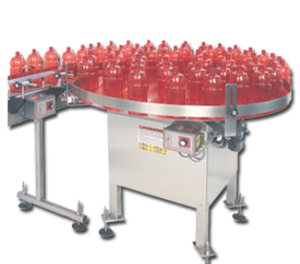 Rotary Accumulating Tables are placed at the end of a production line to receive bottles, jars, cans and containers. The accumulating table helps prevent costly backups and slowdowns in production. Adjustable solid-state D.C. variable speed drive. No changeover parts necessary for standard containers. Stainless steel dumping table (standard on FS-U, optional on FS-A). 33 inch to 37-inch height adjustment. Actual demonstration in our plant with your products. Stainless steel guide rails are standard. • Ideal for accumulating product at the end of the production line.